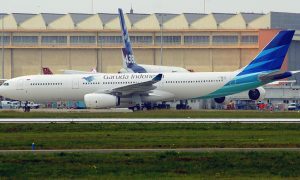 Garuda Indonesia booked a net income of $51.4 million through the third quarter 2015, an increase of 123.4% compared to the same period last year when it incurred a loss of $220.1 million. “Improvements in the Company’s performance are the result of strategic business development measures being carried out through the ‘Quick Wins’ program, as well as a tight cost efficiency policy that was put into effect at the beginning of the year,” he said. Arif, who is also the Chairman of INACA (Indonesia National Air Carriers Association), further explained that this achievement came when the airline industry is facing huge challenges, from a sluggish economy to a number of “force majeures” or natural disasters, such as volcanic eruptions and haze. Speaking of Garuda Indonesia’s ongoing flight network development, Citilink Indonesia’s former president said that the Garuda Indonesia Group (including Citilink) together carried a total of 24.55 million passengers during Jan-Sept 2015, or an increase of 17.5% compared to 20.89 million passengers carried during the same period in the previous year. Through the third quarter 2015, Garuda Indonesia was also able to increase its market share in both the domestic and international markets. In that time, Garuda Indonesia’s domestic market share increased to 44% from the previous 37% in 2014. Meanwhile, Garuda’s international market share from Jan-Sept 2015 reached 28%, an improvement from the previous year’s 22%. 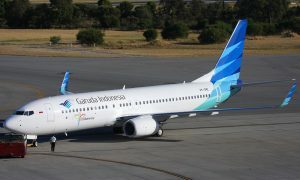 The Garuda Indonesia Group operates a total of 181 airplanes to date, consisting of eight (8) Boeing 777-300ER, twenty-two (22) Airbus A330-200/300, two (2) Boeing 747-400, ten (10) ATR72-600, fifteen (15) Bombardier CRJ1000 NextGen, eighty-eight (88) Boeing 737-300/500/800NG, and thirty-six (36) Airbus A320, with an average age of 4.7 years. By the end of 2015, the Group will operate a total of 187 airplanes, of which 143 are Garuda Indonesia’s and 44 are part of the Citilink fleet, with an average age of 4.3 years. 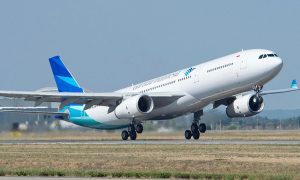 To anticipate the impact of the Rupiah’s weakening exchange rate against the US Dollar, since the first quarter 2015 Garuda Indonesia has signed hedging contracts using “Cross Currency Swaps” with several banks, on Rupiah loans into US Dollars amounting to a total of Rp2 trillion. By carrying out the Cross Currency Swap, the company will be able to avoid or minimize the risk of a rise in operational costs if paid in Rupiah due to the weakening of the Rupiah exchange rate against the US dollar. 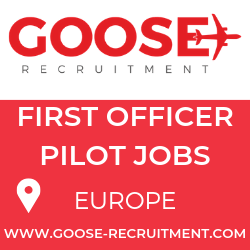 This is due to the fact that an airline’s operational costs that include the purchase of spare parts, aircraft maintenance, and aircraft leasing are mostly conducted in US dollar AS. The company is still watching market developments and at the right moment will again hedge and use Cross Currency Swap to leverage the Rupiah. This is part of the company’s ongoing Risk Management measures based on the prudence principle. Routine hedging transactions against IDR earnings and USD fuel costs have added to the risk management’s work load in the midst of an adverse economic condition at global, regional and national levels.